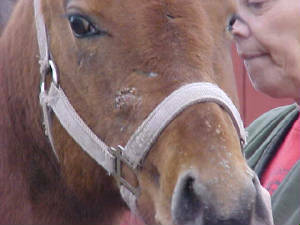 Horses in rehab 2009. 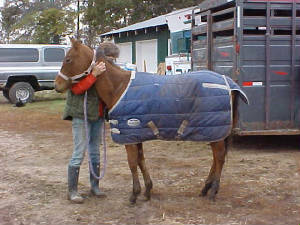 This page contains horses that we took in for rehabilitation in 2009. 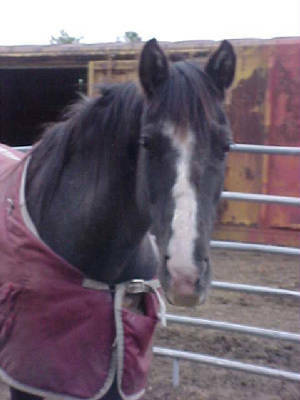 I just left this page as it was and started a new page for 2010; I could have moved the horses listed below to the original "Former Rehab Horses" page but due to the number of photos and the time they take to load, thought I'd just leave them on their own page. 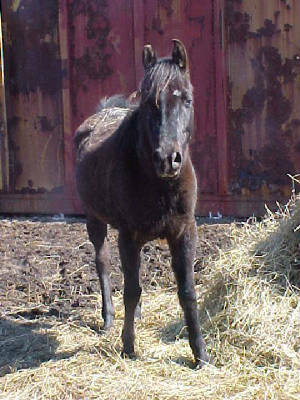 Shadow is a pretty special little filly. 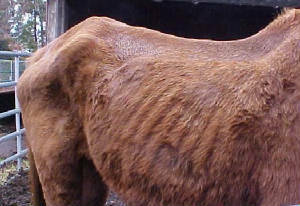 We're thinking she's either a TB or an STB, not quite sure. 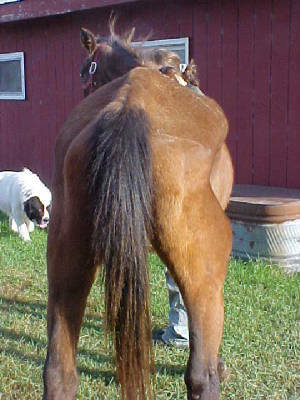 She is halterbroke and friendly and loves attention. Needs quite a bit of weight and also is covered with rainrot. 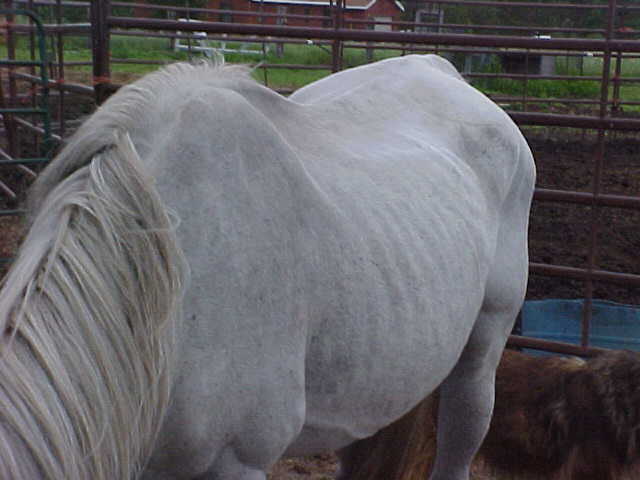 Appears to have no other health or soundness issues. In a few months she'll look like a brand new girl! Photos taken 10/24/09. 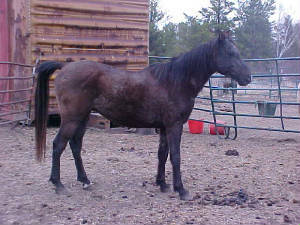 Update 12/13/09: Shadow has been here about 6 weeks and has made a lot of progress. Her rainrot is about cleaned up and she's gained a bunch of weight. 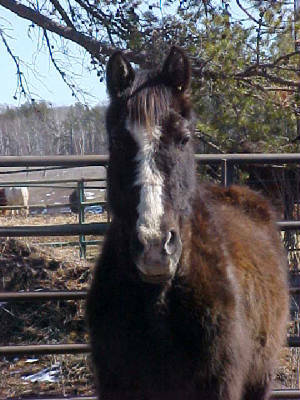 She's still a sweetheart and is now listed on the "rescue horses" page, looking for a family to love her. She looks a bit "dusty" in the pics as I pulled her blanket to snap a few quick and should have brushed her first. Update 1/06/10: Shadow has found a home! 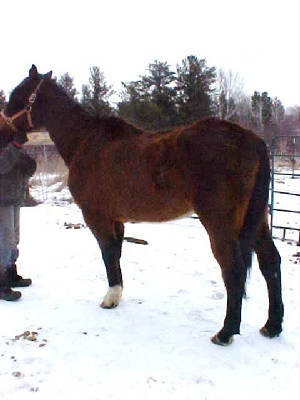 Buddy: Aged grade sorrel gelding. 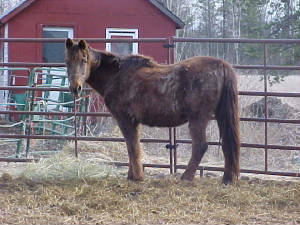 Buddy is a very sweet older gelding. He has a great appetite and seems healthy other than needing TLC! Photos taken 10/12/09. 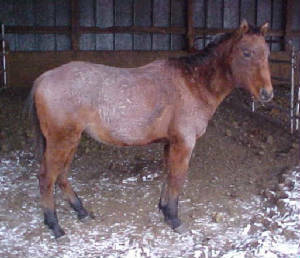 It was snowing when these were taken, and I think in person he actually looks a bit rougher than the photos show. 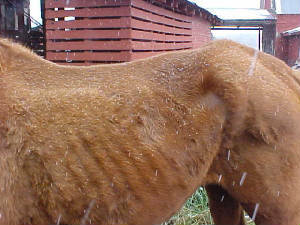 Update 11/19/09: Buddy is slowly but surely gaining weight. 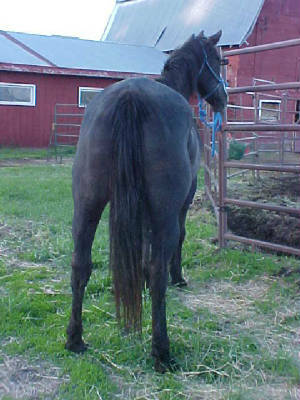 His hindquarters are filling in and his ribs are starting to cover nicely. Tess: Approx. 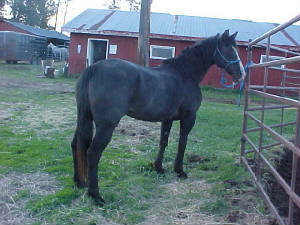 20 year old Standardbred mare. Tess needs a lot of weight and TLC but has been here a week now (photos taken 9/30/09) and is bright eyed and eating well. She has arthritis in one knee but gets along good. 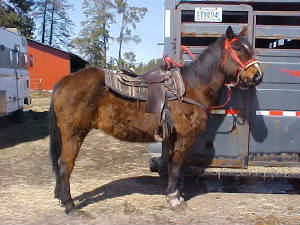 She is supposed to be "kid broke", we'll see if she's rideable/and for what level rider once she gains her weight back. If she's safe under saddle, she will probably only be suitable for light riding/light riders (small children) due to her knee. New photo of Tess taken 12/30/09. She's gained most of her weight back and is ready for a new home now! Better pics coming soon, it was getting dark out so the photos we took don't show her as well as we'd like. 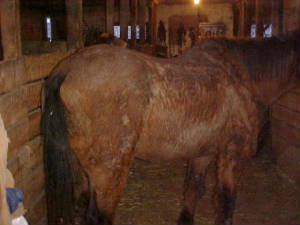 The one above was taken in the barn with the flash. Jack has found a home! 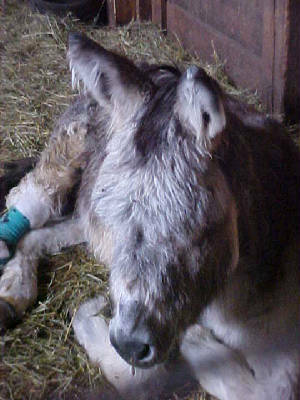 Jack: 6 year old donkey. 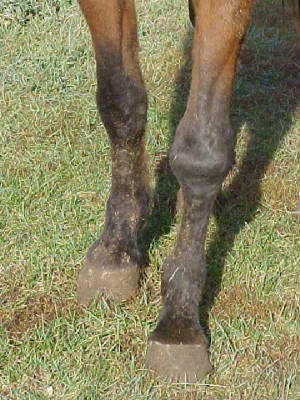 Jack's feet are being fixed up, his previous owner took good care of him but unfortunately their farrier was not familiar with trimming donkey feet and trimmed him the wrong way; he was tipping forward on his feet and causing damage/pain in his tendons, (and therefore spent most of his time lying down). Update 8/25/09: Jack's feet are shaping up and he's doing better. However he hasn't been 100% "right" since we brought him home; this week he tested positive for Lymes disease. He's on meds for 30 days, and we're relieved to have found out what's wrong and have started antibiotic treatment. 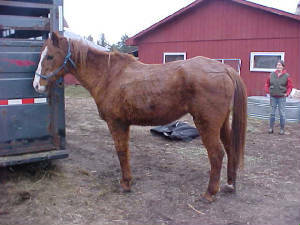 Dee: 16 year old registered AQHA mare. 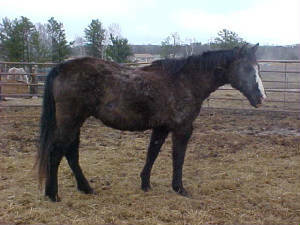 Dee has just been used as a broodmare. She needs quite a bit of weight but has an excellent appetite and appears sound and healthy otherwise. She is very, very sweet and is very easy to work with. 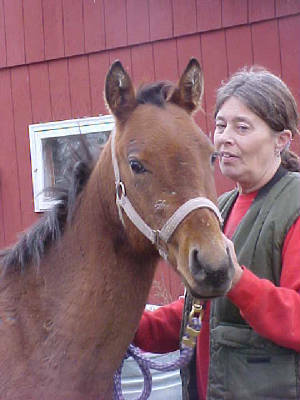 Though she doesn't look it, Dee is a granddaughter of Obvious Conclusion and Sonny Dee Bar (and is HYPP N/N). She will be ready for a new home once she gets her weight back. Update 8/16/09: Dee is gaining weight, slowly but surely. 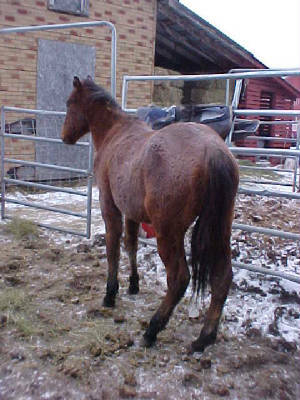 She's a big-bodied mare and it will take some more time for her to finish filling out but she's doing very well. Update: New photos of Dee taken Sept and Oct 2009. 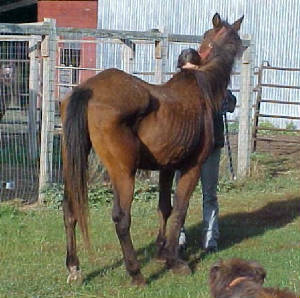 She could stand to gain a little more weight but is looking good and is ready for a new home! Update: Dee has found a home! 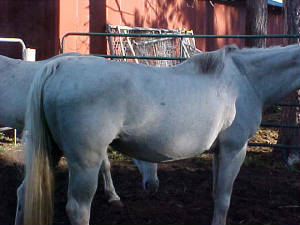 Copa: 20+ year grade gelding. 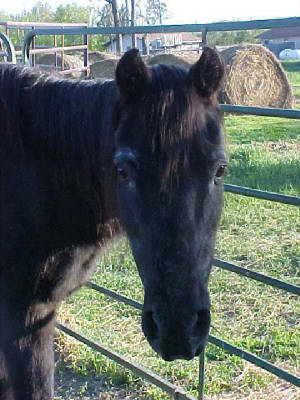 Copa is the sweetest little horse. Approx. 13 hands tall. Photos were taken 5/23/09, he's gained weight since then and I'm sure will be looking good in very short time. We were contacted to see if we could take him in and find him a home. He is very gentle and kind and easy to work with. 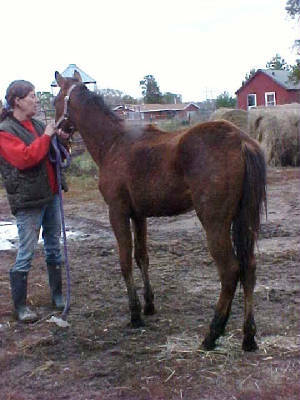 Copa still needs to gain some weight and will then be ready for a new home. 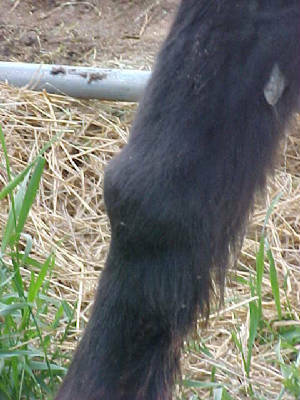 He has arthritis in one knee (pictured above) so is companion sound only. Copa has found his new home. 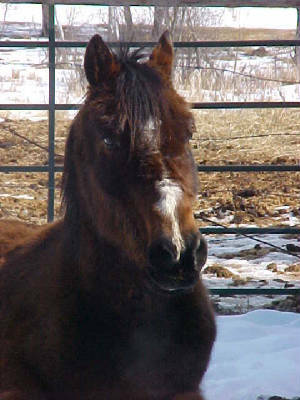 Friday: Aged grade QH mare. 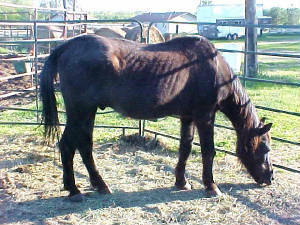 Friday is a sweet older mare that needs quite a bit of weight. 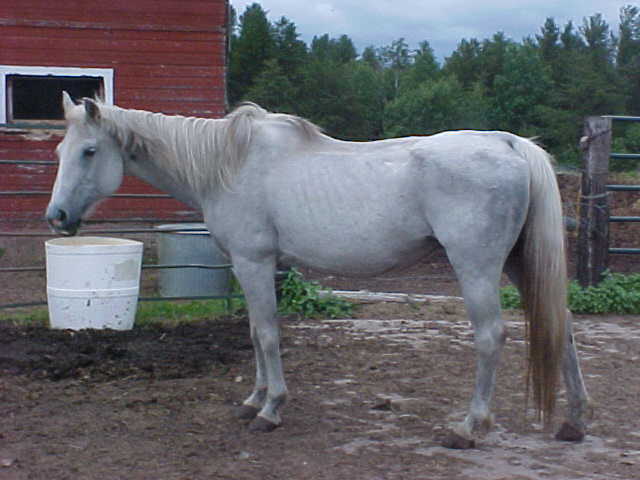 She is supposed to be broke to ride and appears sound and healthy otherwise. She has an excellent appetite and I'm sure it won't be long until we're seeing improvement. Photos taken 3/29/09. Friday has found a home! Photo taken 4/18/09. It's not real easy to see by the photo but Friday has gained a lot of weight since she's been here. She has an excellent appetite and is doing very well. 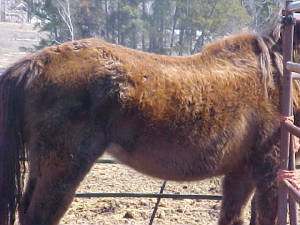 She has some hair loss that is being treated but will be ready to go fairly soon. 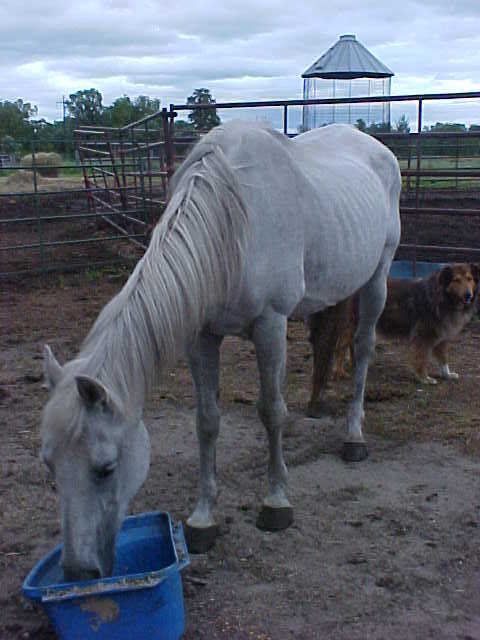 We have ridden her once and feel she will likely be a good child's horse. Photo taken 5/9/09. Friday went from very hairy and thin, to gaining weight pretty fast but losing her hair (down to bald in a lot of places!). She's gained a lot of weight and now grown her coat back, it's shiny and looking good. She'll be ready for a new home very soon! 3 photos above taken 5/16/09. Friday is nearly back to full weight and continues to have an excellent appetite. 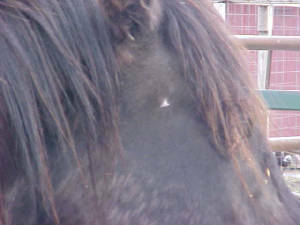 She has shed out her long hair, grown back the bald spots, and looks shiny and healthy! 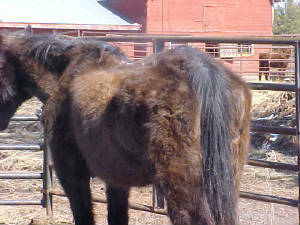 She is about ready for a new home and will be listed on the "rescue horses" page soon. I rode her today and she did very well, though I think it's been a while since she was ridden. 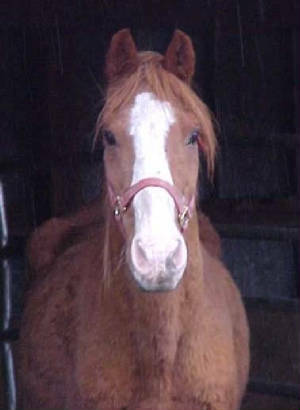 6/12/09: Friday is ready for a home and is now listed on the "rescue horses" page. 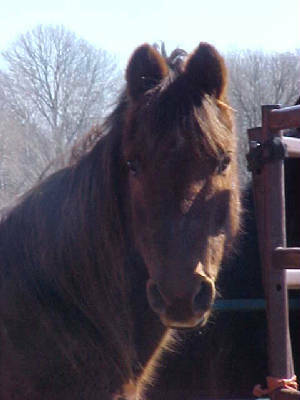 Lucy: Aged grade chestnut mare. Lucy has the cutest little ears we've ever seen. She needs weight but appears sound and healthy otherwise. 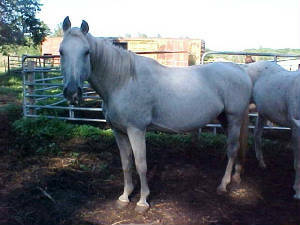 She has a good appetite and is a very nice mare that is well broke to ride. Photos taken 3/29/09. Photo taken 4/18/09. 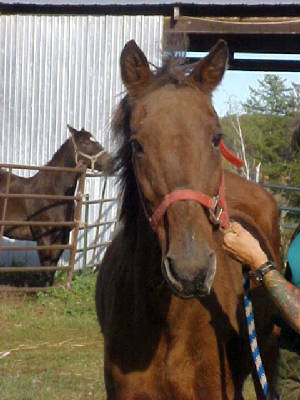 Lucy is doing well and will be ready for a new home soon. 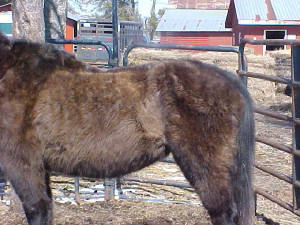 She's gained weight and is shedding like crazy, she looks like a yak right now! Ali: Approx. 5 years old, very friendly boy. 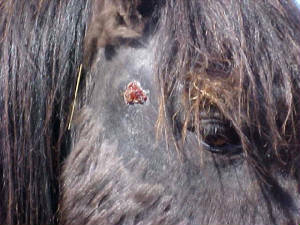 Needs a little weight and has a severe fungus/hair loss problem, mainly on his face, which we are treating now. Photos taken 3/29/09. Photos taken 4/18/09. Ali is doing great, the sore on his face has healed and his hair loss is cleared up. He's now ready for a new home! 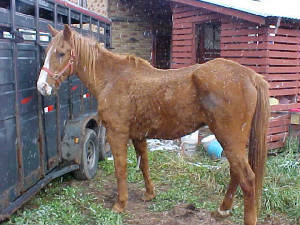 Gus: Aged QH gelding. Photo taken 2/20/08. 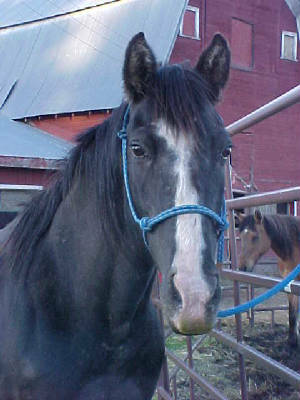 Gus is an aged bay gelding who is supposed to be very well broke to ride. He needs quite a bit of weight, though he appears sound and healthy otherwise. He's getting soaked cubes/beet pulp, and also finer hay which he's doing pretty well on, plus being grained twice a day. He's *very* hungry and willing to eat whatever we give him. Update: 3/29/09. Gus has gained almost all his weight back and is doing well, new photos coming soon. 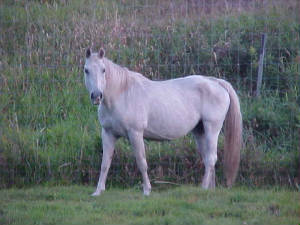 We've found out that "Gus" is actually Dan, a horse we had here last year. He was here for quite a while last summer/fall as I enjoyed riding him, but did advertise and found a home for him later in the year. 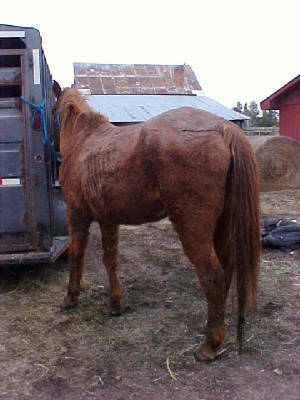 His owner boarded him along with her other horses and was unable to visit them often, but the friend whom she boarded with always told her everything was fine with them all. 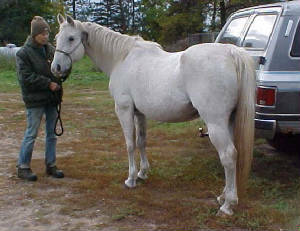 Unbeknownst to her, at some point earlier this year all her horses were sold and some ended up on a dealer's lot. That is where Dan ended up, in poor shape. Due to his heavy winter hair and weight loss, it took us some time to recognize him. 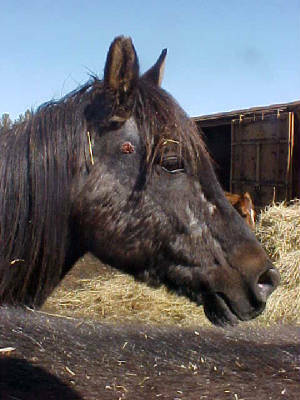 His former owner was horrified to find out what happened to her horses, and is unable to bring any back home due to lack of a safe place to keep them. Dan is doing very well here and has gained all his weight back. This photo was taken 3/29/09.